I'd read anything by Archer without thinking twice. This book was something that I picked up years ago and forgot about. Last month, I sat down to read it. At 416 pages, this is quite a long book. Even the font was quite small and I thought that it would take me at least a month to finish this book. Surprisingly, I finished it in less than five days. This story is supposedly based on true events and the events that sum up the entire novel is quite something altogether. George Leigh Mallory is in love with two women and one of them kills him. The second woman is Ruth, his wife and the first is Mount Everest whom he dreams of scaling day and night. Bitten by the bug of climbing since a child, Mallory is a mountaineer who wishes to reach the summit of Mount Everest one day. He nurtures his dream while working as a professor of history. When he meets Ruth Turner, it is love at first sight for him and he soon marries her after displaying quite an impressive act. Ruth supports and nurtures Mallory's dream, but Mallory's climbing dreams and his fame keeps him away from her and their children for months together. He makes a promise to her that once he attempts to scale Everest, irrespective of whether he succeeds or fails, that will be his last attempt. When he is chosen as the climbing leader for the first ever British expedition to Mount Everest, he is thrilled and wants to reach the summit first and create history. His only other competitor is his namesake George Finch, another climber with exceptional skills and a quest for science. Finch thinks that you can only reach the summit with the help of oxygen cylinders, Mallory does not agree. Their first attempt to scale Everest is unsuccessful and he comes back home with his dream unfulfilled and decides to honor his promise to his wife. He continues his job as a professor but his dream refuses to leave him. When a second expedition is planned, he is tempted to be a part of it but the promise he made to his wife holds him back. Ruth on the other hand realizes that Mallory is missing out on something huge but fears for his life. Finally, she decides to let him go for this expedition so that he can fulfill his dream. Mallory promises to leave Ruth's photograph on the summit if he ever manages to reach the top. When he and his climbing partner Sandy Irvine do not come back from their final climb, the team is not sure of they reached the summit or not. Because there is no proof. Nobody knows if they made it to the top or not. If Mallory did, then he would dethrone Sir Edmund Hillary who was the first person to conquer Mount Everest. But did he? There is a reason why Jeffrey Archer is a master of story telling. This book is a story revolving around just one person, George Mallory and Archer keeps you hooked to every page and every word. Many others told me that the book is boring in parts and gets tedious to read, but I loved every bit of it. I found the narration to be very easy to read and the pace was brilliant. Mallory describes his struggles in the mountain terrain as part of the letters that he writes to his wife. This is how the reader gets to know what is going on up there. This helped break the monotony of just description and no dialogues. Every chapter takes the story forward and the handful of characters helps keeps the story tight and stick to its core. I had goosebumps when Mallory made his final climb and even though the story was written in the past I found myself praying for him. The novel caused a controversy in New Zealand, with the major newspaper 'The Dominion Post' calling it an insult to Sir Edmund Hillary. Apparently, the novel contains several significant factual errors but as a reader I did not find any. I read the book as pure fiction and I enjoyed every bit of it. It evokes the right amount of faith, thrill and fear in the reader and Archer has accomplished that beautifully as an author. Apart from his short stories, I have loved every book of his that I've read. Every character is so strong and so well etched out and George Mallory is no exception. You live his life through the pages, right from his childhood till his end. The description and scene setting is perfect and so realistic. The love Mallory has for his wife reeks out from his letters and the fact that he writes a letter to his wife everyday when he is away is simply romantic. He's a character that I'll not be forgetting for a long time. The prologue of the book drops a major hint about the ending, but that will only make sense once you get to the ending. Verdict: One of the best books that I've ever read. Brilliant. I did find it difficult to read at some points but yes I agree it only added to the entire build up of the book. I had picked it because of the author even though I was not too keen after reading the summary but what a book it had been! Never thought a second before laying hands on jeffery archery books after this one. Surprisingly I found the book to be an easy read. When it is Archer everything seems easy for me. If you haven't yet read 'Kane And Abel', 'Not A Penny More, Not A Penny Less' and 'The Prodigal Daughter' do read it ASAP. Ohhh, that sounds intriguing.... Havent read that one- but certainly wanted to now! Great review- and honest too! That thrill of nature always intrigues me - can so understand it. Go read it Eli, you'd not be disappointed. One of my fav authors and i'd pick his book without a second thought too! I found this one pretty good, though I wouldn't call it an easy breezy read! The controversy bit I did not know! I liked the fact that you added that to the review, it's like a little bit of history attached to it. This was so good, yeah! Some of Archer's books do get on to you at times. 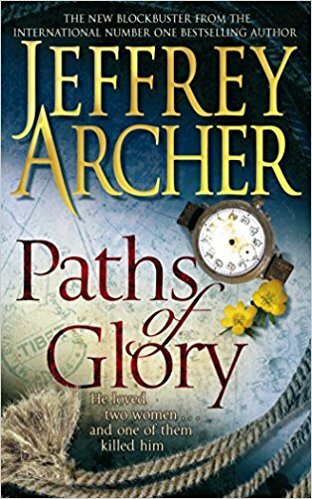 This is one of my favorites from Jeffery Archer. The ending makes me sad though, but the narration is so brilliant. I am always amazed by how he manages to keep the reader always hooked. The ending sure was sad, but justified in a way. Oh yeah, he's awesome! I have read a lot of Archer books and I enjoy them. This one, I will pick up :) Sounds good with that adventure, the desire to fulfill dreams and all that controversy too. Wow! That's high praise. And since I love Jeffrey Archer's books, I will surely pick this one. Thanks for the review. Do read this one, I'm sure you'll enjoy it. I haven't heard much praise for the Clifton Chronicles too. But this one, do read.